What attracted us to sailing yacht 'Velos' was not only its beautiful lines and dark blue hull, but also its really spacious cabins, double saloon and air-conditioning. For our Greek Island cruises we know that the most important thing about a charter yacht is to be spacious and comfortable, both on deck and below, and Velos is exactly that! 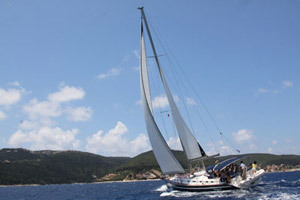 She is a wonderful yacht, designed and built in 2007 by a well known Greek boatyard (Ocean Yachts) for the purpose of charter in the Mediterranean and Caribbean Sea, as well as for long ocean passages. The model is the 'Ocean Star 56.1' and it can be found in a 5 or 6 cabin version, but as space and comfort is a lot more important in our opinion than a bigger number of guests, we decided to have the 5 cabin version (4 guest cabins plus 1 crew cabin). 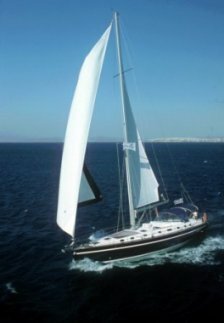 She is a sloop with two large sails, a furling genoa and a furling mainsail, that make it very easy to handle even by one person alone. 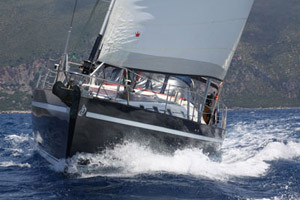 With a total of 150 square meters of sail, Velos can offer some fast and exciting sailing and its 25 tonnes of displacement make it very stable in any sea state! 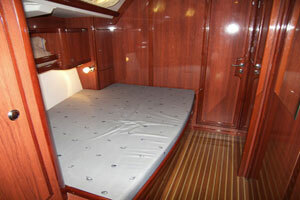 But she is not only a very seaworthy boat, she is a luxurious one as well. 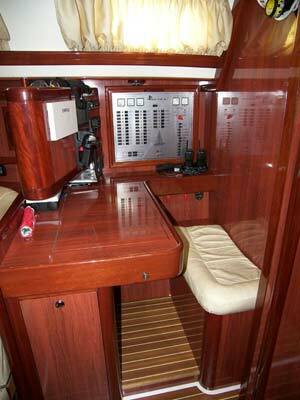 Being a 56 footer, she has a large teak deck with plenty of room for sunbathing or just lying down with a book in the one hand and a drink in the other! A strong guard rail all around, makes it a safe environment for kids who always like to wander around and participate in the sailing of the yacht, during our family cruises. 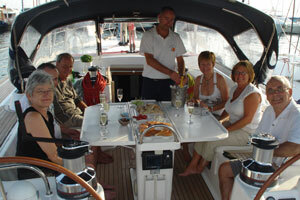 Of course the cockpit is the heart of a boat and so it is designed to accommodate everyone (for a meal or a drink) and still remain practical to do the 'sailing stuff '. 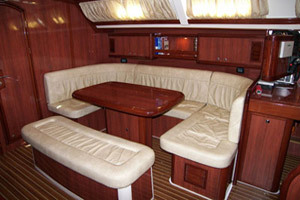 The table in the center of the cockpit, serves also as a fridge for drinks, so you don't have to make the trip below every time you want a drink. 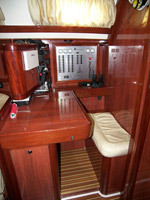 Two steering wheels is something usually seen on yachts racing around the world because of the advantages in handling the boat and sails, but on cruising yachts like Velos it has the added advantage of allowing for a spacious cockpit. The stern, with steps down to sea level and then a ladder extending under the surface, is designed for easy access in and out of the water. There is a shower installed at the stern which is one of the most practical features, as you can rinse yourself from the salt when you come out of the sea, or just cool yourself down if you get too hot while sunbathing. 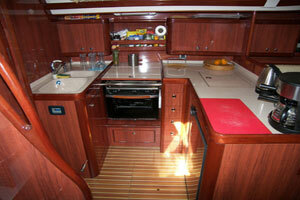 Below decks there is a large double saloon, the navigation area, the galley and the cabins, all lying under the good insulation of the teak deck, spacious and comfortable. 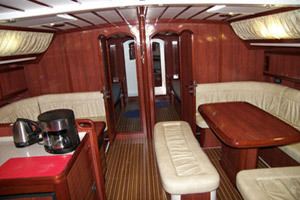 At the starboard area of the saloon (right side) there is a big table with couches all around which makes it ideal for playing table games or having a more formal meal. 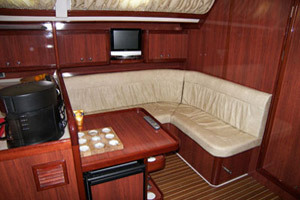 At the port area (left side) there is a coffee table with two more sofas, where you can sit and read your book or newspaper. However in the summer months it is so beautiful outside that people rarely spend much time inside. 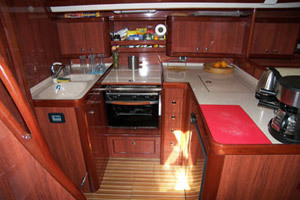 The galley which is situated at the far left side of the saloon towards the stern, is very functional with big surfaces to work, a large sink, gas cooker, two refrigerators, ice maker, a blender for cocktails and all the cooking utensils that could possibly be needed on a yacht. That is where Alicia's famous lunches are created!!! The navigation area is well equipped, with a GPS, VHF-DSC radio, EPIRB, Electronic Chart Plotter, wind speed - depth - boat speed meters, and weather forecast receiver, but as we prefer the traditional ways, all the charts and pilot books are there and in daily use. On the recreation side of things, there is a TV and DVD player as well as a Radio and CD/MP3/IPOD player with speakers in the salon and on deck. 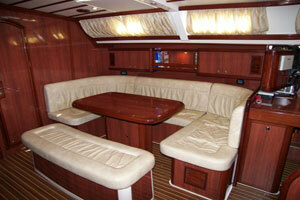 The collection of movies and music onboard is big, but you are always welcome to bring your own. Additionally, there is a computer and equipment to access the Internet in case you want to keep in touch with family and friends, or more important, use it for your business. There are computer games, although there are always better things to do on a yacht than get stuck in front of the screen! However, it is a great thing if you want to forget your kids for a while! 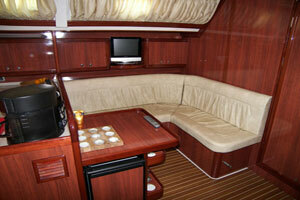 The accommodation consists of five cabins altogether. The four of them are situated around the saloon and the fifth which is the crew cabin is at the bow with a separate entrance from the deck. They are all en suite with a toilet, sink and a shower. 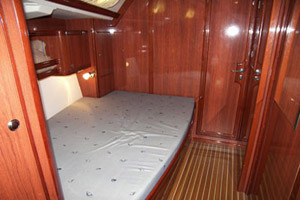 The two guest cabins forward of the saloon have a double bed and the bathroom is situated at the far end towards the bow of the boat. 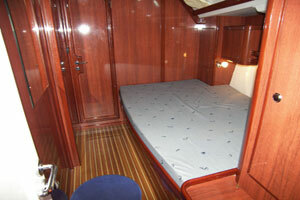 The two guest cabins aft of the saloon have a double bed (in size it is really a triple bed), with a removable part in the center so it can be turned into 2 single beds. 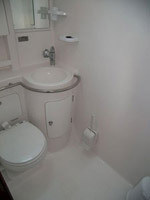 However, because of the bigger size bed, the bathroom is a bit smaller. 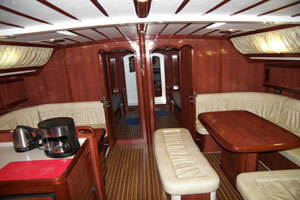 Access to all four cabins is from the saloon. One of the most important features of Velos is the air-conditioning which keeps the interior in a very pleasant temperature during the hottest months of the summer. 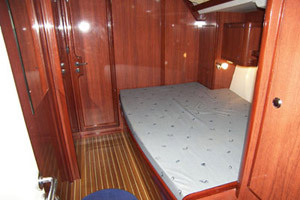 Every cabin is air-conditioned, as well as the saloon, and although during the daytime we all cool down in the sea, the air-conditioning makes all the difference for a good night sleep. 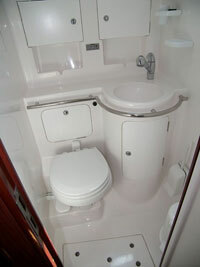 Except for the air-conditioning, every cabin is also equipped with a fan. The engine is a powerful Yanmar 160HP, used to take the yacht in and out of a harbor and take us to the destination when there is no wind. The diesel tanks have a capacity of 750 liters which is enough to make long passages across the Mediterranean Sea, just with the engine alone and finally, the water tanks have a capacity of 1500 liters which is more than enough for the needs of the boat. In November 2013 we installed a water-maker (desalinator plant) which produces 350 liters of water per hour, for complete independence! 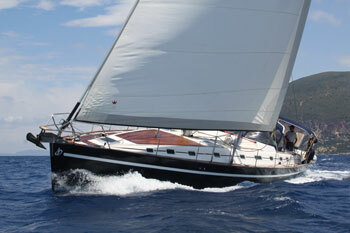 Yacht Velos' Specifications & Equipment.